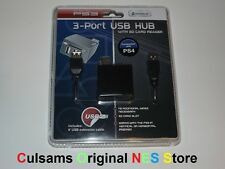 This simple USB 5-port hub is compatible with both PS3 and PS3 slim, and is the perfect solution for anyone wanting more then 2 USB ports. Easily plug-in and charge your controllers and accessories in just seconds. You can even use this hub to charge or power any of your USB enabled gadgets. Trending at $8.75eBay determines this price through a machine learned model of the product's sale prices within the last 90 days. Includes six foot USB extension cable. OFFICIAL USA RETAILER - FREE USA SHIPPING! 5 out of 5 stars - CronusMAX PLUS for PS4 XB1 PS3 XB360 - OFFICIAL CRONUS EBAY ACC - FREE USB HUB! 3 product ratings3 product ratings - CronusMAX PLUS for PS4 XB1 PS3 XB360 - OFFICIAL CRONUS EBAY ACC - FREE USB HUB! NEW VGA's 4 PORT MINI USB HUB: A stylish 2.0 USB HUB that can hide almost anywhere, yet looks just as cool out on display. NON CONTINENTAL USA AK / HI / PR / APO / FPO / & OTHER US TERRITORIES. Features:This product is 3.0HUB, and the data transmission is fast.When the product is working, the power socket has high current stability.Increase the power interface to ensure a stable current when large data is transmitted.The LED indicator allows you to determine if the hub is powered.Specification: Working voltage: DC5VWorking average current ≤800mAWorking frequency: 30MWorking function: 3WColour: BlackMaterial: ABSSize: 11*3.4*14.5cmPackage Includes: 1 x. Feature: Product interface: 4Ports usb 3.0 Product color: black The usb 3.0 interface supports unicersal insertion, plug and play; Easy to use and easy to carry Conforms to USB 3.0 specification and is compatible with USB2.0/USB1.1 USB3.0 port can support 4 USB simultaneous use, (transmission data and charging) Notice: Due to the difference between different monitors, the pictures may not reflect the actual color of the item. USB 3.0 to Multiple 4 Port USB 3.0 Hub. Often copied but never equaled, the Yellow-Price USB 3.0 Hub is now better than ever. Yellow-Price Portable Slim 4-Port USB 3.0 Data Hub. Portable 4-Port USB 3.0 Ultra Slim Data Hub. Easier access to USB ports. Excellent product! Ultra Compact With Exclusive Foldable Cord Design: enables a more convenient way for storage and travelling. The UH400 4-Port USB 3.0 Hub from TP-Link is here to help. This compact USB hub features a built-in USB 3.0 Type-A connector cable to plug into your computer's USB port. This is a Rockband USB 2.0 4-Ports HUB Adapter! Good overall condition. It is used and in good physical and working condition. Minor signs of light scuffs. with great care with BUBBLE WRAP or FOAM. Make sure you see pictures they are of the actual item(s). Tested and working. Includes AC power adapter. USB Hub allows 4 USB devices to connect to into 1 USB port. Suitable for all USB ports. Model: RBG253. Item Type: PlayStation 3. Platform: Sony PlayStation 3. Type: USB Hub. Signs of wear can include aesthetic issues such as scratches, and discoloration. Condition: Used: Very Good. Condition: Used Very Good.